Users of Office365 surely knows about the “app launcher” – the place where you will find the tiles used to navigating around. In case users have a license for Project Online, they will obviously find the Project icon in one of the tiles. Unfortunately, the link for this Project tile is pointing to the default PWA site collection often known as https://customer.sharepoint.com/sites/pwa. You should now see a the new tile in the overview. Close the pop up. 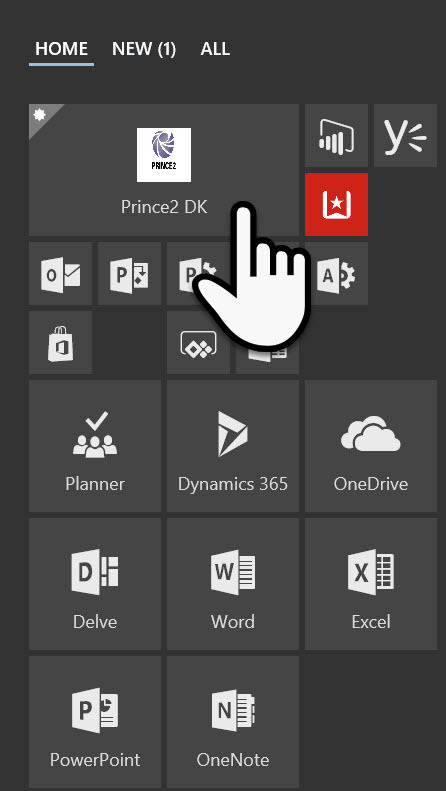 In my case, I can now see a new Prince2 DK tile, and the customized icon. Tiles can be sized small, large or wide. So remember to find a good picture that will fit the expected end size. My example is not good:-) Now click the tile! …and you, and everyone else, should now be taken to the correct PWA/Project Online hub.